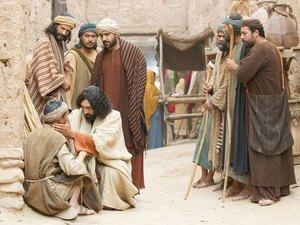 When the neighbors and acquaintances of the man who had been healed of blindness brought him to the Pharisees, the religious leaders demanded to know who had healed him. The discussion soon became about whether this miracle and miracle-worker were from God (John 9:8, 13-17). The Jews then attempted to discredit the miracle by talking to the man’s parents. But they corroborated his words—he was their son and had been blind all his life. But they refused to express an opinion about whether Jesus was a prophet from God or not. Why? Because they feared excommunication (John 9:22). Indeed, excommunication was the treatment the healed man received after he defended Jesus (John 9:27-34). “Nevertheless even among the rulers many believed in Him, but because of the Pharisees they did not confess Him, lest they should be put out of the synagogue” - John 12:42. “'They will put you out of the synagogues; yes, the time is coming that whoever kills you will think that he offers God service’" - John 16:2. What was this “put out of the synagogue” that was such a threat? "Put out of the synagogue - This took place in the temple, or near the temple. It does not refer, therefore, to any immediate and violent putting forth from the place where they were. It refers to excommunication from the synagogue. "Among the Jews there were two grades of excommunication; the one for lighter offences, of which they mentioned 24 causes; the other for greater offences. The first excluded a man for 30 days from the privilege of entering a synagogue, and from coming nearer to his wife or friends than 4 cubits. "The other was a solemn exclusion forever from the worship of the synagogue, attended with awful maledictions and curses, and an exclusion from all contact with the people. This was called the curse, and so thoroughly excluded the person from all communion whatever with his countrymen, that they were not allowed to sell to him anything, even the necessaries of life (Buxtorf). It is probable that this latter punishment was what they intended to inflict if anyone should confess that Jesus was the Messiah: and it was the fear of this terrible punishment that deterred his parents from expressing their opinion" (emphasis added - Barnes Notes on the Bible - John 9.). What the blind man’s story and its fallout says to me is that putting our faith in Jesus can have serious consequences. We readily accept that such a belief severs us from the world. But here it separated a man from his religion as well including the community that was part of that faith system. As contemporary Christianity drifts farther and farther away from its biblical anchors, could such separation be ahead for us too? And I ask myself, am I, are we willing to pay that price? PRAYER: Dear Jesus, I love it that You sought out that excommunicated man and communicated to him who you were and that You accepted him. May Your approval and friendship be enough for me too. Amen.